Our Wild Birds: Whoo Hooo!!! Purple Martins!!!! Kent and I hit the store early today to try to get the hanging basket brackets attached to the house. I must say, it looks great, but MAN was it a pain to get the brackets attached to the brick! Anyway, as we were discussing the proper placement of the brackets in relationship to each other, the window boxes, the windows, and the deck, Kent suddenly says, "Martins!" This is soooo typical of us. We are doing something... anything, and one of us will hear "X" bird, and give the ID on the call. It's kinda funny, as we tend to do it while other folks are around too & usually they just don't "get it." So, Kent states, "Martins!" and we both flip around to look at the gourd system that is very strategically placed on the edge of the back parking lot, between our store, Wild Birds Unlimited, and Las Palmas Mexican Restaurant. There they were, in and out of the gourds - so I ran and grabbed the camera. Lucky for me, one of them came back and posed at the top of the pole. I promise, this is not a "decoy martin." I am very hopeful that they will return, and decide to nest with us. There are several successful colonies in the area, so although we are SO close to the mall, we may have a chance at helping these wonderful birds out. We will keep our fingers crossed through June - as there is still a chance for a new colony to start that late. There are many things that people do not understand about these birds - ideas that have been perpetuated by some less than ethical, or simply misinformed, folks. 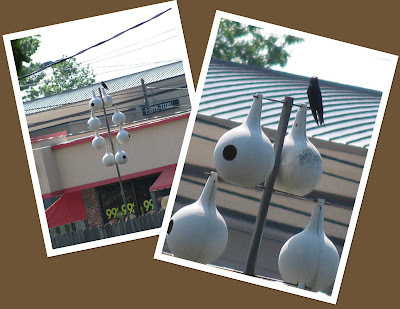 If you want the real poop on these guys visit the Purple Martin Conservation Association site. We really like good science, and try to keep with that information.